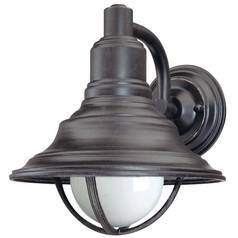 The following are detailed specifications about the Exterior wall light. 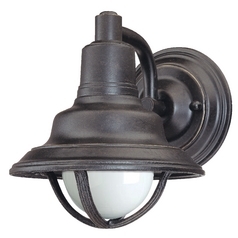 This outdoor wall light is a traditional take on the marine nautical theme. Featuring a deep Winchester bronze finish with a decorative cage to protect the 100-watt medium base G25 frosted bulb (not included). Backplate diameter 4.75". Suitable for installation in dry, damp, and wet locations. 120 volts line voltage. UL / CUL certified. We bought these lights to go on a new garage at our cottage. We wanted the nautical look and we thought these fit the look we were after. They look great against our pale yellow siding. This Exterior wall light is part of the Bayside Collection from Dolan Designs. The following items are also part of the Bayside Collection.